In December 2016, Congressman Smith visits one of the small structures used to house multiple families at a refugees camp. Just days before Christmas, a leading human rights lawmaker, Rep. Chris Smith (NJ-04) went to Iraq to witness first-hand the plight of Christians who escaped ISIS into the Erbil area of the Kurdistan region and the failure of the Obama Administration to help them. After meeting with Christian families and leaders, and officials from the U.S., other Organization for Security and Cooperation in Europe (OSCE) participating States and the United Nations, Smith said he returns to Washington to lead Congressional efforts to target more humanitarian aid to Christians and other religious minorities who have survived genocide. Smith also visited a camp for 6,000 internally displaced people, managed and supported by the Chaldean Catholic Archdiocese of Erbil. “I also saw how the Obama Administration has shortchanged organizations conducting criminal investigations and collecting, preserving and preparing evidence usable in criminal trials. Perpetrators will dodge punishment unless there is specific evidence linking them to specific atrocity crimes. My Iraq and Syria Genocide Relief and Accountability Act legislation is a blueprint for how to assist Christians and other genocide survivors and hold perpetrators accountable. I will be working tirelessly to get this bill on the new President’s desk when we reconvene in January,” added Smith. In 2002, there were as many as 1.4 million Christians in Iraq. After years of sectarian conflict, followed by the ISIS genocide that began in 2014, they have dropped to less than 250,000. Most of the Christians who survived ISIS fled to the Erbil area, which now hosts more than 70,000 internally displaced Christians, almost a third of all Christians in Iraq. Iraqis have been eight percent of the refugees and migrants who arrived by sea in the OSCE region in 2016. The Chaldean Catholic Archdiocese of Erbil has provided most of the assistance to these displaced Christians – and has also assisted Yezidis and Muslims – including food, shelter, medical care, trauma care, and preparations for the impending winter. Smith was invited to Erbil by Archbishop Bashar Warda, head of the Archdiocese. During their meeting, Archbishop Warda emphasized that unless the ancient Christian communities of Iraq received significant financial support very soon, they may not survive. This legislation is supported by many groups including the Knights of Columbus, 21st Century Wilberforce Initiative, In Defense of Christians, Yazidi Human Rights Organization International, Commission for International Justice and Accountability, Center for Religious Freedom at the Hudson Institute, Religious Freedom Institute, Simon Wiesenthal Center, Open Doors and others. The bill has also been endorsed by all of the former U.S. Ambassadors-at-Large for War Crimes: David Scheffer (1997-2001), Pierre-Richard Prosper (2001-2005), Clint Williamson (2006-2009) and Stephen Rapp (2009-2015). 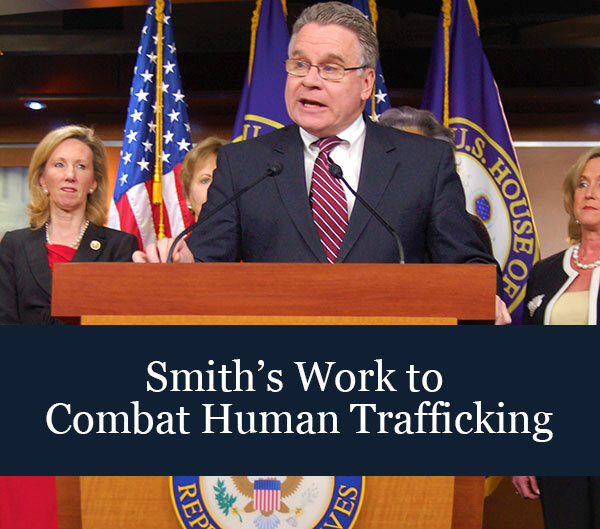 Smith also authored the bipartisan H. Con. Res 121, which the House passed overwhelmingly and calls for the formation of an ad hoc tribunal for perpetrators of crimes against humanity and war crimes in the Syrian conflict. Just last week, the President signed into law the bipartisan, historic Frank Wolf International Religious Freedom Act (H.R. 1150), which Smith authored and Eshoo co-sponsored. This law makes sweeping changes that will help ensure that the U.S. Administration and the State Department have the tools, training, and resources to anticipate, help prevent, and respond to genocide and other persecution against religious communities like Christians in Iraq and elsewhere. Smith continues to encourage leaders in other OSCE countries to provide more humanitarian assistance to Christian genocide survivors and support criminal investigations into and prosecutions of perpetrators.